The development of vaccines to protect against viral disease is one of the hallmarks of modern medicine. The first vaccine was produced by Edward Jenner in 1796 in an attempt to provide protection against smallpox. Jenner noticed that milkmaids who had contracted cowpox, a relatively innocuous infection, seemed to be resistant to smallpox, a disease of humans that regularly reached epidemic levels with extremely high mortality rates. Jenner theorized (correctly) that cowpox, a disease of animals, was similar to smallpox. He concluded that the human reaction to an injection of cowpox virus would somehow teach the human body to respond to both viruses, without causing major illness or death. Today, smallpox is totally eradicated. Only two frozen samples of this virulent virus exist (one in the United States, the other in Russia), and as of mid-1995 there is serious scientific debate about whether to destroy the samples, or keep them for further laboratory study. A virus is a small bit of RNA (Ribonucleic acid) and/or DNA (deoxyribonucleic acid), the material in all living cells that instructs the cell how to grow and reproduce. Viruses cannot reproduce by themselves, but only by taking over the nucleus of a host cell and instructing the cell to make additional viruses. When a virus successfully invades an organism, it takes over the cell growth process in the host. Under ordinary circumstances, the human body responds to viral invasion in several different ways. Generalized immunity to a virus can be developed by the cells in the body that are targets of viral invasion. In this situation, viruses are prevented from gaining access to host cells. A more common protection is the body's ability to develop blood and lymph cells that destroy or limit the efficacy of the invading virus. Often, an infected human body will "leam" how to respond to a specific virus in the future, so that a single infection, especially from a relatively benign virus, usually teaches the body how to respond to additional invasions from the same virus. The common cold, for example, is caused by one of several hundred viruses. After recovering from a cold, most people are resistant to the particular virus that caused the particular cold, although similar cold viruses will still cause similar or identical symptoms. For some innocuous viruses, a person might even develop immunity without becoming visibly ill. There are usually several variations or strains of any particular virus. Depending on the number of varieties, a biologist might group viruses as types or strains. Vaccines frequently are made from more than one group of related viruses; a preventive reaction to the multivalent vaccination will probably cause immunity to almost all of the group's variants, or at least to those variants which a person is likely to encounter. Choice of the specific members of the group to use in a vaccine are made with painstaking care and deliberation. task of creating a potential vaccine in the laboratory. The change from manufacturing a potential vaccine in small quantities to manufacturing gallons of safe vaccine in a production situation is dramatic, and simple laboratory procedure may not be amenable to a "scale up" situation. 1 Manufacturing begins with small amounts of a specific virus (or seed). The virus must be free of impurities, including other similar viruses and even variations of the same type of virus. Additionally, the seed must be kept under "ideal" conditions, usually frozen, that prevent the virus from becoming either stronger or weaker than desired. Stored in small glass or plastic containers, amounts as small as only 5 or 10 cubic centimeters, but containing thousands if not millions of viruses, will eventually lead to several hundred liters of vaccine. Freezers are maintained at specified temperatures; charts and/or dials outside of the freezer keep a continuous record of the temperature. Sensors will set off audible alarm signals and/or computer alarms if the freezer temperature goes out of range. 2 After defrosting and warming the seed virus under carefully specified conditions (i.e., at room temperature or in a water bath), the small amount of virus cells is placed into a "cell factory," a small machine that, with the addition of an appropriate medium, allows the virus cells to multiply. Each type of virus grows best in a medium specific to it, established in pre-manufacturing laboratory procedures, but all contain proteins from mammals in one form or another, such as purified protein from cow blood. The medium also contains other proteins and organic compounds that encourage the reproduction of the virus cells. As far as the virus is concerned, the medium in a cell factory is a host for reproduction. Mixed with the appropriate medium, at appropriate temperature, and with a predetermined amount of time, viruses will multiply. neither acidic or basic (neutral) has a pH of 7. Although the container in which the cells are growing is not very large (perhaps the size of a 4-8 quart pot), there are an impressive number of valves, tubes, and sensors connected to it. Sensors monitor pH and temperature, and there are various connections for adding media or chemicals such as oxygen to maintain the pH, places to withdraw samples for microscopic analysis, and sterile arrangements for adding the components of the cell factory and withdrawing the intermediate product when it is ready. 4 The virus from the cell factory is then separated from the medium, and placed in a second medium for additional growth. Early methods of 40 or 50 years ago used a bottle to hold the mixture, and the resulting growth was a single layer of viruses floating on the medium. It was soon discovered that if the bottle was turned while the viruses were growing, even more virus could be produced because a layer of virus grew on all inside surfaces of the bottle. An important discovery in the 1940s was that cell growth is greatly stimulated by the addition of enzymes to a medium, the most commonly used of which is trypsin. An enzyme is a protein that also functions as a catalyst in the feeding and growth of cells. In current practice, bottles are not used at all. The growing virus is kept in a container larger than but similar to the cell factory, and mixed with "beads," near microscopic particles to which the viruses can attach themselves. The use of the beads provides the virus with a much greater area to attach themselves to, and consequently, a much greater growth of virus. As in the cell factory, temperature and pH are strictly controlled. Time spent in growing virus varies according to the type of virus being produced, and is, in each case, a closely guarded secret of the manufacturer. 5 When there is a sufficient number of viruses, they are separated from the beads in one or more ways. 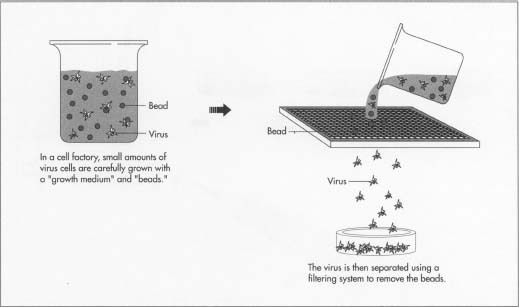 The broth might be forced through a filter with openings large enough to allow the viruses to pass through, but small enough to prevent the beads from passing. The mixture might be centrifuged several times to separate the virus from the beads in a container from which they can then be drawn off. Still another alternative might be to flood the bead mixture with another medium which washes the virus off the beads. The eventual vaccine will be either made of attenuated (weakened) virus, or a killed virus. The choice of one or the other depends on a number of factors including the efficacy of the resulting vaccine, and its secondary effects. Ru vaccine, which is developed almost every year in response to new variants of the causative virus, is always an attenuated vaccine. The virulence of a virus can dictate the choice; rabies vaccine, for example, is always a killed vaccine. 6 If the vaccine is attenuated, the virus is usually attenuated before it goes through the production process. Carefully selected strains are cultured (grown) repeatedly in various media. There are strains of viruses that actually become stronger as they grow. These strains are clearly unusable for an attenuated vaccine. Other strains become too weak as they are cultured repeatedly, and these too are unacceptable for vaccine use. Like the porridge, chair, and bed that Goldilocks liked, only some viruses are "just right," reaching a level of attenuation that makes them acceptable for vaccine use, and not changing in strength. Recent molecular technology has made possible the attenuation of live virus by molecular manipulation, but this method is still rare. 7 The virus is then separated from the medium in which it has been grown. Vaccines which are of several types (as most are) are combined before packaging. The actual amount of vaccine given to a patient will be relatively small compared with the medium in which it is given. Decisions about whether to use water, alcohol, or some other solution for an injectable vaccine, for example, are made after repeated tests for safety, sterility, and stability. To protect both the purity of the vaccine and the safety of the workers who make and package the vaccine, conditions of laboratory cleanliness are observed throughout the procedure. All transfers of virus and media are conducted under sterile conditions, and all instruments used are sterilized in an autoclave (a machine that kills organisms by heat, and which may be as small as a jewel box or as large as an elevator) before and after use. Workers performing the procedures wear protective clothing which includes disposable tyvek gowns, gloves, booties, hair nets, and face masks. The manufacturing rooms themselves are specially air conditioned so that there is a minimal number of particles in the air. In order for prescription drugs to be sold in the United States, a drug manufacturer must meet strict licensing requirements established by law and enforced by the Food and Drug Administration (FDA). All prescription drugs must undergo three phases of testing, although data from the second phase can sometimes be used to meet third phase requirements. Phase 1 testing must prove that a medicine is safe, or at least that no untoward or unexpected effects will occur from its administration. If a medicine passes Phase I testing, it must next be tested for efficacy—it must do what it is supposed to do; medicine cannot be sold that is useless, or that makes claims for an effect that it does not have. Finally, Phase III testing is designed to quantify the effectiveness of a medicine or drug. Although vaccines are expected to have effectiveness close to 100%, certain medicines might well be acceptable even if they have limited effectiveness, as long as the prescribing physician knows the odds. The entire manufacturing process is reviewed carefully by the FDA which examines records of procedures as well as visiting the manufacturing site itself. Each step in the manufacturing process must be documented, and the manufacturer must demonstrate a "state of control" for the manufacturing process. This means that scrupulous records must be kept for every step in the process, and there must be written instructions for each step of the process. Except in cases of grievous error, the FDA does not determine if each step in a process is correct, but only that it is safe and is documented sufficiently to be performed as the manufacturer stipulates. Producing a usable, safe antiviral vaccine involves a large number of steps which, unfortunately, cannot always be done for each and every virus. There is still much to be done and learned. The new methods of molecular manipulation have caused more than one scientist to believe that the vaccine technology is only now entering a "golden age." Refinements of existing vaccines are possible in the future. Rabies vaccine, for example, produces side effects which make the vaccine unsatisfactory for mass immunization; in the United States, rabies vaccine is now used only on patients who have contracted the virus from an infected animal and are likely, without immunization, to develop the fatal disease. The HIV virus, which biologists believe causes AIDS, is not currently amenable to traditional vaccine production methods. The AIDS virus rapidly mutates from one strain to another, and any given strain does not seem to confer immunity against other strains. 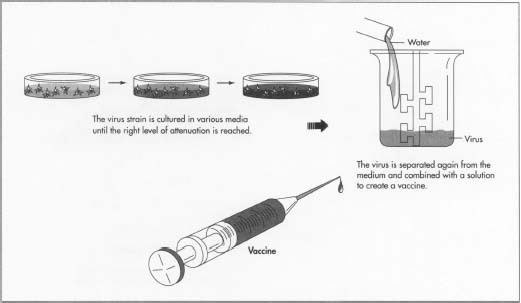 Additionally, a limited, immunizing effect of either attenuated or killed virus cannot be demonstrated in either the laboratory or in test animals. No HIV vaccine has yet been developed. Dulbecco, Renato and Harold S. Ginsberg. Virology. 2nd edition. J.B. Lippincott Company, 1988. Plotkin, Stanley A. and Edward A. Mortimer, Jr., eds. Vaccines. W.B. Saunders Company, 1988. Given the rational for how vaccines work, I am puzzled as to why the Rabies vaccine would be given to someone *after* they have already contracted the virus. Since the vaccine contains the virus, why would giving someone an additional viral load help this patient? My understanding is that vaccines are prophylactics-they are only good if consumed prior to infection. Can you provide a rational as to why giving someone the Rabies virus after they already are infected with it helps, I would appreciate it.